Today we are going to see the Best Ping Pong Tables Under $300: Which One is the Winner?So, below are the exclusive lists! If you’re a professional player or new player who likes to play TT, we have listed so many guides which will guide you through. 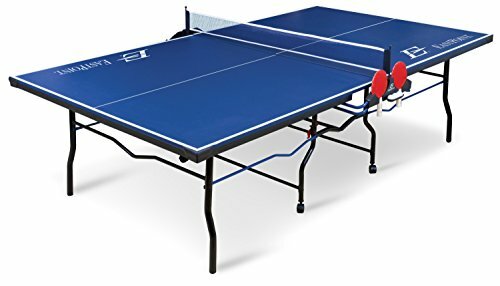 We’ve also listed some of the best inexpensive ping pong tables you can buy. You can check our our recommendations for the best ping pong under USD 300 or read the full reviews. 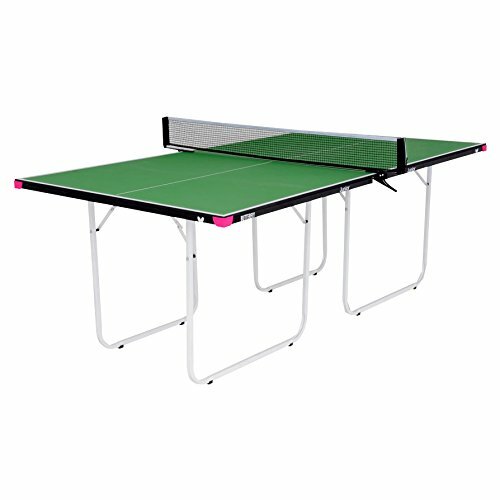 If you’re looking for a tournament-sized table at a reasonable price then, EastPoint Sports 3000 is the best choice for you. It comes with the dimensions of 9 x 5 feet and can disassemble it into two separate pieces and fold it and store it in a small space. EastPoint Sports 3000 gives good stability guaranteed with a steel frame and comes along with rust-resistant and powder-coated that makes durable in use and naturally long-lasting in storage. You can lock the wheels while playing and transfer the table wherever you like, the surface of the table is laminated that will provide a good bounce. And also paddle storage system, storage system on both sides of the net making sure that you will never lose that small ball again. 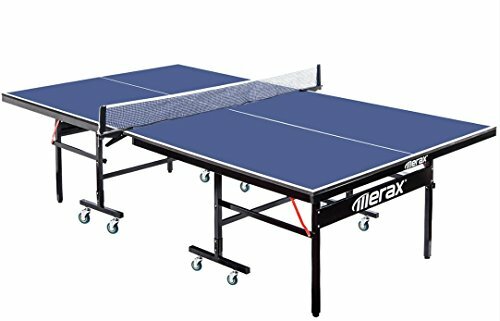 This ping pong table will take your skills to new heights, Merax Everest Series is mainly for beginners and professionals, it offers quality training and tournament grade builds. Merax Everest Series comes with 5 feet wide and 9 feet long that meets the competition requirements. The table is user-friendly you can dismantle and fold the table with the support legs. And also it can separate into two sections that will be easy to transfer. Whenever you don’t want to use it fold it and store it in the corner of a room. Merax Everest Series has 8 wheels out of 8, 4 will be lockable that keeps table still while playing. Stiga Advantage Indoor is arguably the best equipment and affordable for indoor play. Stiga will be best for those who are looking to recreate tournament play at home. The Stiga Advantage is easy to set up and can be easily stored as well. It comes completely assembled which will be easier to play at home. If you want a piece of equipment that is suitable for adults and kids then undoubtedly Stiga Advantage Indoor is the best one for you. It comes with the Safety Latch System. 72-inch Tournament Grade Net and Post Set. Specs: 63 x 56 x 5 inches, 188.9 pounds, 5/8”-thick top. 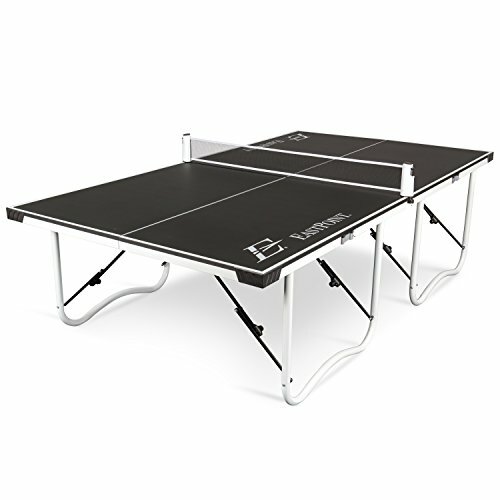 EastPoint Sports 15mm ping pong table will be suitable for use in small spaces, as it can be foldable into a small size so that it can fit under a coach, in a closet, or under a bed. The table comes with astounding features like easy to carry handles and roll wheels. And the other things that make this product one of the best is that it can be easily assembled as it comes preassembled soon you will be ready to play. EastPoint Sports come with 9ft x 5ft that will be a tournament-sized table and 15mm thick playing surface for enhancing a better bounce of the ball. 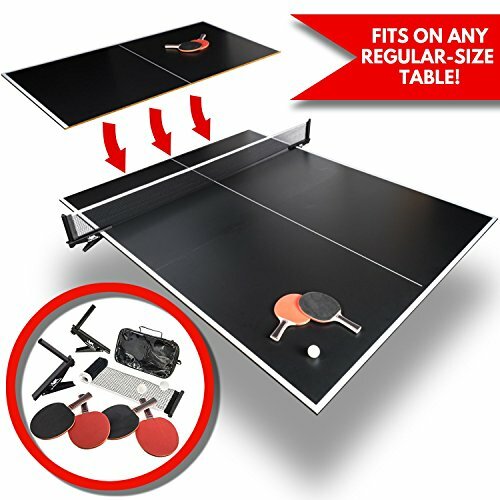 It is the durably constructed ping pong table with 1.5″ thick legs, powder-coated rust-resistant steel frame, and the aprons warping and molded corner caps that protect the table corners from damage. 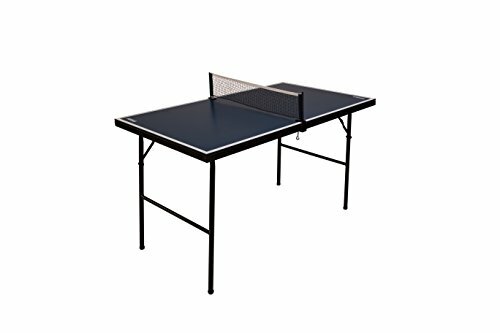 If you don’t have enough space for ping pong table but still wishes to keep one then, Milliard Mini-Pong Portable Tennis Table is undoubtedly the best one for you as it is of 71.2 x 40.5 x 30 inches at a reasonable price. And the other astonishing features of Milliard Mini-Pong Portable has two quality wooden paddles and three ping pong balls. By which, you can play the game as soon as the table arrives with no extra equipment. In this ping pong table, you don’t have to require much assembling by folding the legs, fix the two halves, and clamp the net you can get for playing. And the reinforced legs will ensure that it won’t be wobbling or collapse while playing the game, the rubber grips on the bottom will enhance the steadiness. If you are searching for a compact ping pong table that will be easy to store, then without a doubt, JOOLA MIDSIZE is the best choice as it one of the company’s bestsellers and has set an unbeatable mark. JOOLA MIDSIZE comes on two-thirds the size of a regular ping pong table with 72 x 36 x 30 inches of dimensions. It can keep separately and use for different purposes like Card games, Dice game. You don’t have to assemble, as the surface small but still, adults can play with their kids however net is not that good but considering the price it is fair. But JOOLA MIDSIZE is not for the professional player, it is mainly for kids, and it is not large in size and suitable for children. If you’re practicing and looking for an easy way to get out then, JOOLA Inside Table will be the best choice for you. And under the 300$ will be ideal for the family or office for a piece of equipment where they can get out of the way when not in use. It comes with a professional-grade playing surface with its 5/8ths-inch, 1.5-inch steel legs can be folded up to a compact size while storing. You can keep it as freestanding models for entertaining. JOOLA is easy to move with two lighter sections one heavy and potentially cumbersome unit. At this price, you will not get a product like this, however, there are issues with its ability to hold up over time but, it is flexibility and economy. It comes with the Independent Table Halves. It is Safe & Mobile Storage. JOOLA 72 Inch Tournament Grade Net and Post Set. Specs: 108 x 60 x 30 inches; 189 pounds, 196 pounds. 5/8 inch (15 mm) thick medium-density fiberboard (MDF). 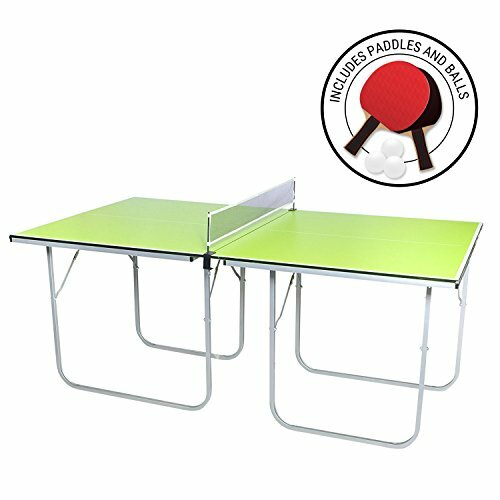 This one is another small size ping pong table that is of ¾ sized product ideal for schools or indoors. Butterfly Junior comes with strong protective edging trim and a playing surface of 12mm and 81 x 45 x 30 inches of dimension. It has wheels on each so that moving around is easy and you can fold the legs more compactly for storing it. If you don’t have space then, this will be a good one as Butterfly Company has set an unbeatable mark for making quality products. So there is nothing to worry about the durability, there are a paddle, balls, and net. Butterfly Junior is mainly for kids to have a fun round of ping-pong with friends. By the name itself you can figure it out that you don’t have to give much time for assembling. 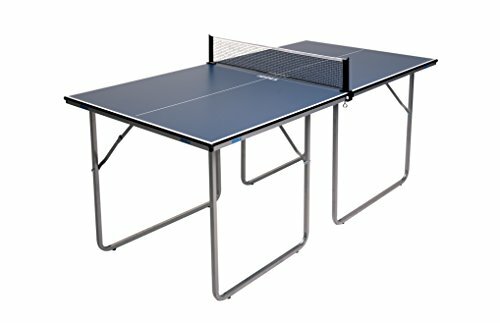 Franklin Table Tennis Table will not waste time fixing a table tennis table, it will set it up in minutes and, you can play the game for long hours. And you can easily store inside the room by folding the table. It comes along with the 5 x 9 feet and stands at 30″ by which, you can play in small space too. By the easy carries, handles will enhance for transferring. The table is of a thick steel frame. 9mm thick playing surface ensures a durably constructed ping pong table. If you’re searching for the ping pong table that can be easy to assemble, durably built, and compact in size then, Harvil 60-Inch is arguably the best as it comes 59 x 26 x 27 inches of dimension, 30.9 pounds that will be ease of storage and foldable design as well. And of the best thing about the Harvil 60-Inch is that you can fold into the size of a briefcase and carry anywhere. 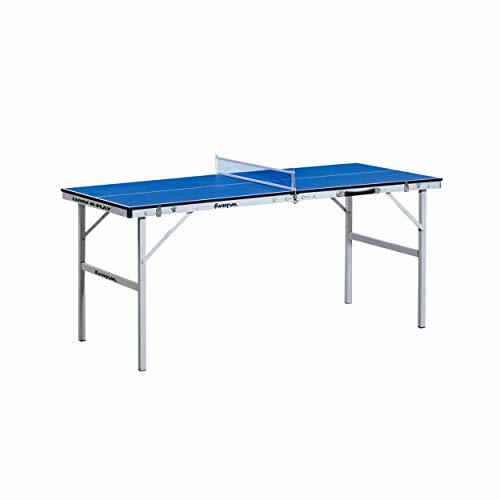 It comes along with a powder-coated solid steel frame and assurance of a durable table tennis table. Harvil 60-Inch has the fixed fasteners by which, the table is safely locked when folded, and the sturdy handles that will be easy for transferring. If you want a compact ping pong table that will fit in a small room then, JOOLA Connect Mini Magnetic is mainly for you as it has 54 x 30 x 30 inches and 36 pounds that will enhance portability. The JOOLA Connect Mini Magnetic Modular Table is the most unique in contrast to other ping pong table in the list. The strong magnets on each side will connect to the other tables and achieve a regulation-size table tennis table connect four tables. It comes along with the custom size regulation net by which, you will not have to get this on its own and, the retractable net. And also you can use JOOLA Connect Mini Magnetic on an uneven surface with the help of adjustable levelers. The table comes in red, light green, dark blue and medium blue colors. 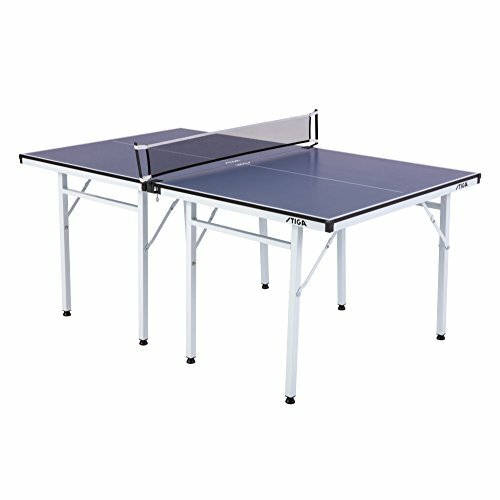 If you have thought of getting a convertible table tennis Top instead of a table tennis table then, Convertible Table is ideal for you, it can be fit in any such as pool table, kitchen table, outdoor picnic table, and dining table. And designs is to protect table surfaces from scratching or any damage since the high-density foam backing that will not let scratching and sliding. The table comes with the assurance of a stable playing surface and the magnets that keep the table in alignment. 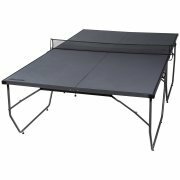 It can be easily set up and storing will be easy too since the Convertible Table Tennis Top comes with three equal parts that require a one person set up. It becomes 9ft x 5ft when it is joining together that will be a full-size table tennis table and comes along with the four paddles, balls, a regulation net, mini-plastic spacers, and a carry bag. If you have a small apartment or small office then, getting STIGA Space Saver Table will be an ideal choice. It has a foldable design that can be easily stored and comes along with the separate table halves which will customize it to suit your needs. STIGA Space Saver has a durable powder coated steel frame and a silkscreened logo designed to resist wear and tear with the 38.5″ heavy-duty net and a post set to enhance the ease of set up. Killerspin revolution has set an unbeatable mark of sports in the United States. The Revolution combines exceptional performance and modern aesthetics for a model at a reasonable price. Killerspin Revolution Indoor comes along with its steel arches supporting the playing surface, sturdiness and 16-layer roller coated surface with limited glare and resists marking. In contrast to other models in its class, Revolution Indoor has similar features but at a cheap rate. And without a doubt, Killerspin Revolution Indoor provides world-class play, but once you set up, it will not be easy to move. It has a solid steel frame. Simple to set up and secure. Specs: 140 x 60 x 29.9 inches; 6.4 ounces. 22mm Medium Density Fiberboard (MDF). 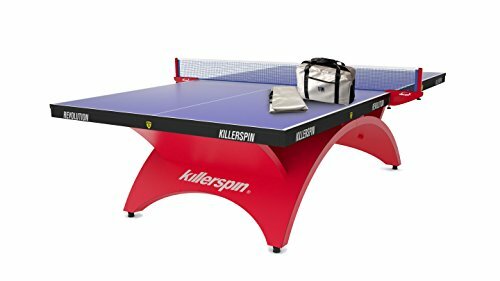 So this is the list of ping pong tables that comes under $300 I hope you like it and you can pick the best ping pong table for yourself.